You know your blender can be used to make smoothies. Heck, maybe you’ve even used it once or twice to purée some veggies or to smooth out a batch of soup. But the blender can be used for a lot more than all that — and it needs to be that way to justify taking up all that counter space. 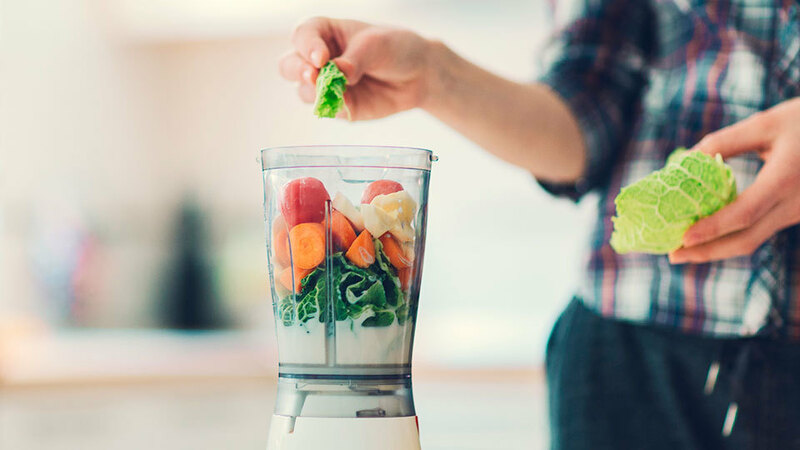 From crêpes to compost and back again, these are all the ways you can make the most of your blender. Need to finely chop a bunch of veggies or make a mince from different aromatics? Pre-chop them into large chunks that easily fit into your blender, then pulse until your ingredients reach the desired texture. Juicers are hard to clean and take up a ton of counter space, but getting juice at a café or shop costs a ridiculous amount of money. Luckily, you can make juice with a blender (preferably a high-speed model, like a Vitamix) by puréeing your preferred fruits and veggies, then straining them through a fine mesh strainer or nut milk bag. Juice without the hefty price tag! Tired of your hand-mixer splattering everywhere when you try to make whipped cream? Blender to the rescue! The blender makes a thick, rich whipped cream in just minutes. From crêpes and pancakes to waffles and muffins, the blender makes quick work of breakfast bread batters. Oat milk, nut milk and rice milk, oh my! You can save a fortune by making your own nut milks at home. Just blend your chosen milk base with water until smooth, then strain. Enjoy smoothies on the go with this clever hack. Twist a Mason jar full of smoothie ingredients onto your blender base, then blend until smooth. Carefully unscrew the jar, and voila — a smoothie ready to be taken out the door with you. Other than the dreaded midnight microwave “ding!” not much is louder than a blender. Luckily, you can keep things quiet by placing your blender base on a silicone mat, which will help diffuse the sound. Help your compost to enrich your soil more quickly by breaking it down in the blender before you add it to the garden. Just don’t mistake it for a smoothie or you’ll be in for a rude awakening. If you don’t have an hour before guests arrive to let your wine breathe, try pulsing it in the blender a few times to aerate. From hollandaise to mayonnaise, making emulsified sauces in the blender takes way less time than using a whisk. Trust me, your wrists will thank you! Creamy homemade butter can easily be made in the blender. No weird ingredients and a slightly sweet fresh dairy flavor that can’t be beat. Frozen fruit and a little juice are all you need to whip up a batch of healthy fruit sorbet in the blender. It’s like ice cream you can actually feel good about eating.